Pitter patter on the window pane, a hot cuppa cocoa, legs curled up on the couch, hands stretched out to feel the water droplets on your hand. That sounds like a perfect whimsical monsoon weekend at home. You have nothing to worry about – that’s how it feels like, isn’t’ it? Then, Monday arrives, and takes everything out of the equation except the rain. Now, imagine stepping out for work or wherever else you have to be. Oh no! Reality check because you can’t always afford to take a rain check. 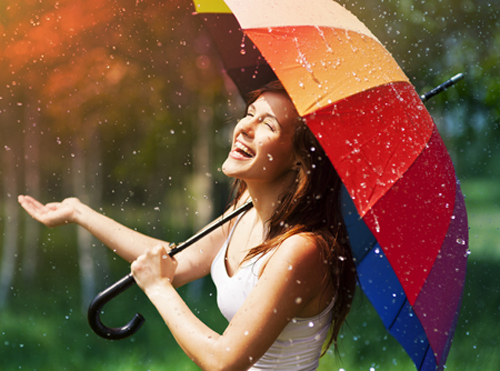 Be it monsoon or one of those surprise showers, it’s always good to be prepared. I’ve been there and done that. Thanks to work and travel and living in different cities – I have seen it all (well, almost). Rainy days to gloomy thunderstorm weathers! 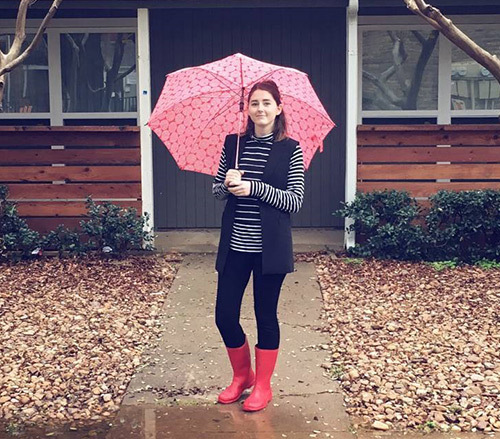 And so, here I am with my two cents on everything you need and outfit ideas for the rainy day(s)! Let’s see how to keep the water at bay, literally! 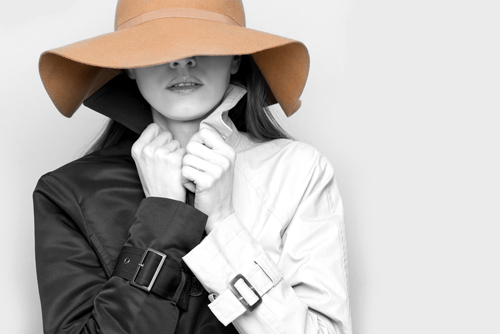 A classic trench can never go wrong. You don’t have to think twice about wearing a short dress or a skirt. This is a piece of clothing that tops the chart for rainy day essentials. Layer it up and look cute. Gloomy days can sometimes be accompanied by constant drizzle. It feels like there is a storm underway, but there’s no action. And then, my friend, hats are your go-to. Just work on a statement that blends well with hats. They usually sit well with jeans, distressed pants, dresses (short and long), etc., unless prom dresses are on your mind. Congratulations! You are now stylish and sorted! When I say umbrella, it’s not the big-boring-black ones our mothers carry. I mean the other fancy options out there. An umbrella is a must. Go for a transparent one or something colorful. Some days, an umbrella just doesn’t cut it. You will know what this means if you live in windy areas or cities that experience a full-blown monsoon. 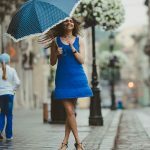 Like umbrellas, raincoats have also gotten better, and you will be pleasantly surprised with the options out there. Fashionable or not, you need one of them to survive monsoons. Yes, we agree that boots are not fancy to look at or wear, but there is nothing worse than going around in trousers soaked in mud and rain. Carry a pair to change after you’re indoors, but these are a must. Another thing I’ve added to this list that might seem frivolous. However, I’ve ended up with damp cash bills and laptop chargers too many times because I was ignorant. If you carry your electronic devices like laptop or tablet with you all the time, invest in a laptop sleeve made with nylon or anything else that is waterproof. And, ensure that your actual bag is waterproof as well. Double layer it just to be doubly sure. The denim jackets have been around and are one of those outfits worth every penny you invest in. They look cute in summers and can actually help you during those rainy days. Layer a tank with a denim jacket – you can just pull it off when humidity kicks in or tie it at the waist just like the old times. Pair it up with ankle length denims and remember to fold it up further or go with a pencil skirt. The slip on shoes save you from the splatter as you walk. Plus, they are comfortable and make good statements. And not to forget, you could either go for a hat or a cutesy-transparent umbrella. Unfortunately, most of us have to act like grown-ups and step outdoors to run errands or show up at work. But, how are you supposed to put in efforts when it’s pouring? 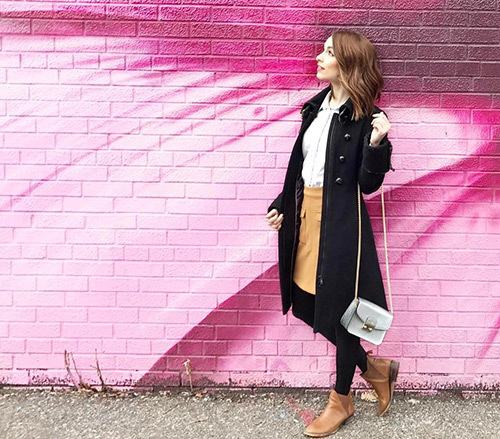 Wear a knee length dress and up your style by sporting the classic trench. 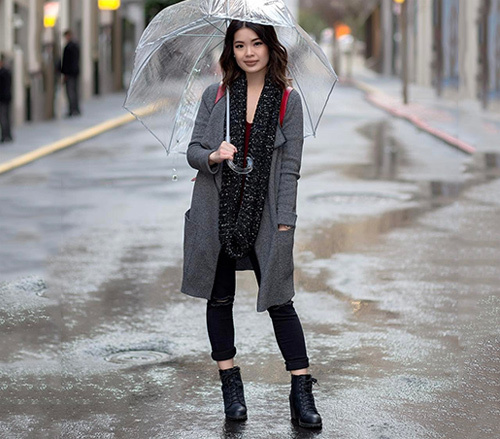 Monsoons are the best times to use that trench, so make the most of it. Some say that these are quite expensive for the not-so-great-looking design. But, it’s time we prioritized comfort over everything else. And, these help you a great deal during rains. They are easy to dry, save you from splatter from your own feet, and are comfortable to walk in. So, if you’re planning a vacation or live in cities where you need to survive four months of constant downpour, invest in crocs. They go with almost anything, especially jeans, capris, hot pants, shorts, and dresses. Dressing up can be pretty therapeutic and sometimes make you feel that gloomy days are actually not so bad after all. For an evening party on a rainy day, go for a black dress, be it an LBD or not, and pair it with a pair of ankle boots. They save your feet from getting soaked and your style quotient remains on point. Besides, you can get some impeccable pictures on days like these. Either way, dressing up is a total win-win. Are you a fan of jumpsuits? Then, here’s good news. It’s one of the most preferred costumes because it gives you coverage. Wear a jumpsuit, throw on slip-ons or sneakers, and you’re sorted – just like that. 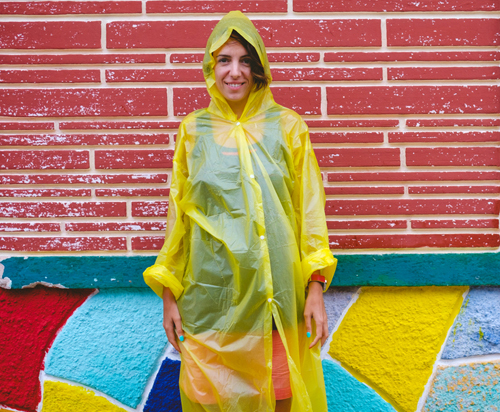 A funky and vibrant waterproof jacket will brighten your outfit. 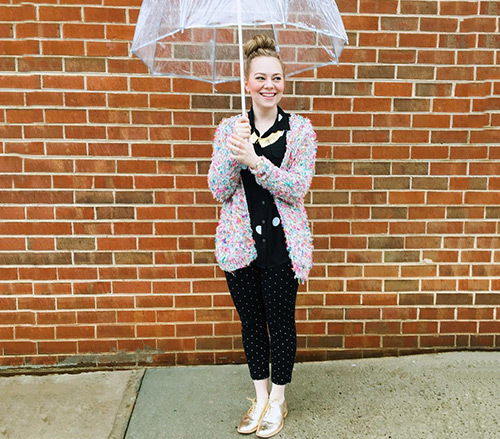 If you’re looking to buy an umbrella, invest in one that comes in polka dots patterns and adds an instant charm to your look. Hey, anything to cheer you up on gloomy days, right? We all have them, and we all love them. Fold your distressed jeans to make it ankle length. This not only adds punkiness but also protects you from those water puddles. Throw on a tank and layer it up with a shrug, sweater or cape, depending on how hot or cold the weather gets. 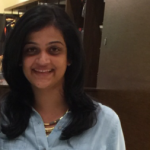 And, that is exactly why you should consider layering during monsoons. A scarf will make the look pop and is a smart addition to keep you warm. Monsoons in a few cities last for over two months, and only smart dressing can be your savior. Mix and match looks, and let the accessories speak for themselves. A monochrome look in black is foolproof and it is established by now. So, all you need to do now is bump it up with a long leather or fashionable rain jacket, a scarf, neatly tied bun, and boots to bring it all together. You can either break the monochrome look by wearing neon kicks or play along with leather boots. One of the easiest and most effortless looks there is. You can go on for an entire season just with a pair of leggings, a few tops, and a leather jacket. Rotate them using the same formula, and you’re practically sorted with your monsoon closet. One look you carry everywhere you go. I did not even see the point of a half jacket for a very long time. I then realized that I was missing the point. It’s perfect for a rainy day, keeps you warm, plus looks absolutely classy. It adds definition to any outfit you randomly choose. Accessorize your turtle neck T-shirt with neckpieces that stand out and wear them over leggings, jeggings or skinny trousers. 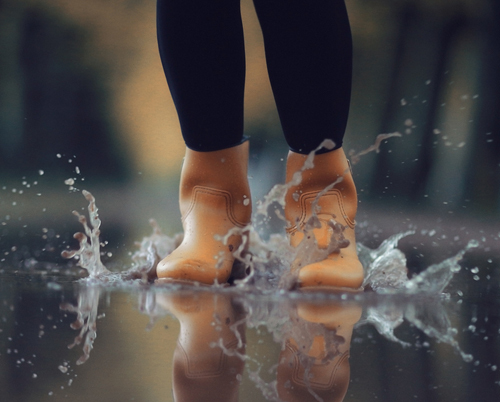 Boots are your best bet since they keep your trousers dry – or just about any shoes will do. Like I said, we all need to show up to work and sometimes important meetings, no matter how gloomy and dingy the weather gets. There’s hardly anything we can do about it, right? But, you can be charming and wear exciting clothes even when the weather is not necessarily on your side. A formal skirt with a shirt tucked in is known to be classy. 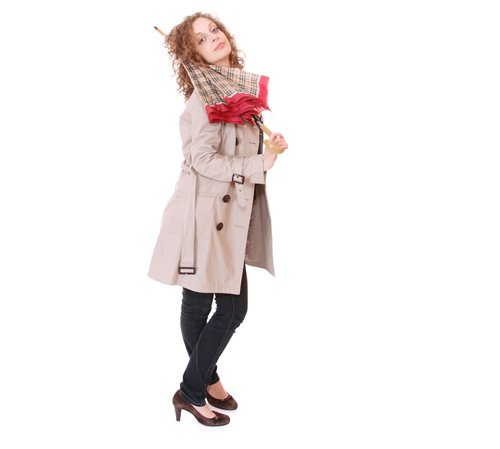 Now, pair it up with opaque stockings to keep you warm, and finish the look with a trench coat. 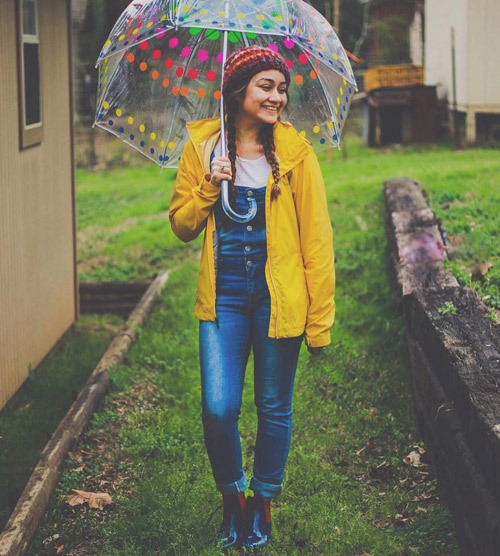 Now that you know what to wear on a rainy day, what are you waiting for? Go enjoy the rain! But keep these things in mind, and you will never have to tell a friend “I’ll take a raincheck” (literally) for a party. Nothing is more welcoming than those droplets from the first monsoon, even better if you’re prepared. Because, you don’t have to compromise on fashion, come what may! Hope you liked all these cute rainy day outfits. Don’t forget to leave a message if you have any questions!